“I don’t think the LMS is dead”. New technologies and ideas can be blended with old, not necessarily replacing them. You wanted to talk about both multi-modal learning and learning styles. Were there points you just wanted to go through and bring up with me, or did you want me to ask you questions? This last week or two, I was trying to read over Project Tin Can’s site, and I was thinking, what would I have wanted in the past that I didn’t see, and I think it’s more, it’s much less instructor-led, or even content-led, but where it would be more of a learner- led instruction. Case in point, I was talking to a colleague today, like I was saying in the last week or two, trying to think — If you could do an online course, and I’m using an analogy mind you, of like a young chef who has never actually been a cook, and they basically give him a course. And within the course it’s saying, “What makes up a pb & j?” You got peanut butter, you got jelly, and you got the bread. It depends on whether or not the student wants to know — How do I make them? What else comes with it? So it kind of, the course, allows the learner to route into another course that he would have taken ultimately, but it allows the learner to engage based on their ability to learn more. They self-taste, and it drives them into another — so it’s like a sequence — where it takes you into where you might need like, to get a knife, a plate for your sandwich, a napkin, what have you. And then, from the knife, if you could draw a circle around that and create another course, that may of course concern the knife and how it was used to make the sandwich, but in this instance the knife would be like cutting techniques, maintenance, safety, how to safely store your knives. And all these courses are a way for you to guide them, and with like the napkin, and the plate, and the table setting, that could be like, maybe like the restaurant, the front of house manager, this cooking school actually have the instructors learn learner’s interest in how they get the value, of like, their grade-score and how their directing could really show their career path. And how decision-making — we could apply that with what we’ve done, like say, in the military, when I used to work for the Air Force. I was developing course content and I did a lot for civil engineers. This was kind of theory was something we thought a lot about a lot in the past, we didn’t know how to get there. So something I would have liked to see in SCORM or some future communication would be to see how you could, not just quantitative, like did they take the course, but qualitative and help decision- making for instructors or for the military aspect of doing things. It’s not so much instructor-led or even content-led, but learner-led is something I would like to see in the future. You are asking people for their opinion and this is my opinion. You might have to eventually take all coursework, but it would allow them to go — If someone is a slow learner. Like when I was a kid in school, I was a child of the seventies, when I was in elementary, I had to read a book, so I’d read the page, go through the chapter, and then go back and re-read it, and that’s how I learned. And I never really learned — just go in, take the test — boom, that’s how it worked for me. Today’s learners, the only thing I can think — I had those little quirky phrases I was saying, “The future of e-learning is e = mc2!” And what I mean by that, is “e” is to e- learning, to ever grow exponentially, and you get bigger and bigger; mobility, in all learning applications of any kind and anywhere learning, not just physically located on the LMS that’s sitting in somebody’s desktop or school house, but the mobility of an iPad, for example. And beyond that, just mobility for mobility’s sake. The last one is the collaborative nature, and I think we’re looking at getting into a situation where people learn from experiential, just like that old saying, “You can give a fish to somebody, feed him for a day; teach them to fish, they can eat for a lifetime.” It’s the same kind of thing, an instructor can give life experiences, and students can learn from other students in a collaborative nature; and that’s what I mean by e = mc2. 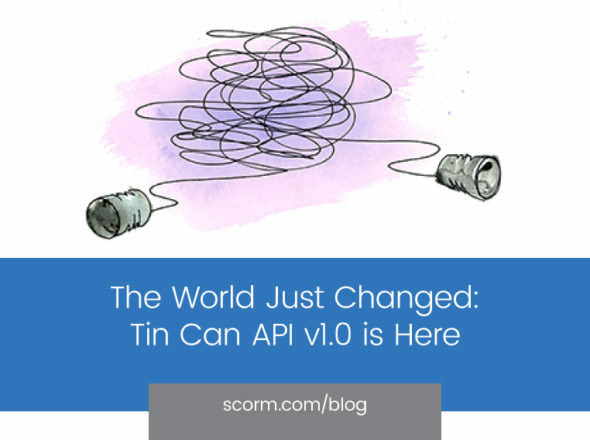 That’s something I think will happen and something that Project Tin Can is all about. SCORM is based on people, who would sit at their desk, in front of an LMS, take that coursework and then go like that. It’s got to move beyond that; it’s just a sidebar. Like I say, I think it’s going to be more learner-led instructions. Have you had anyone suggest anything similar? I don’t recall people saying “learner-led” exactly the way you are describing it, I have heard people say you have to have information about the learner to present the content that will be the most relevant to them. I’ve heard that learners need to be able to contribute information for the benefit of tother learners. That they should be able to rate courses to help people looking for courses. It’s not the same. On my page right now, I’ve got a circle going around peanut butter and jelly and bread, and then I’ve got a wider circle around napkin, knife, and plate, and then I’ve got the circle that goes outside that circle that shows cutting and — I have got it like. But if it were put in a different context, if I’m a commanding officer at an Air Force base, and I’m watching my airmen learning different things: one’s learning the basics of what they have to do, and then he starts going into power production for forward-base deployment, so he’s doing that, but for some reason he starts to shift over to look at runway repair. It allows the commanding officer to see who is taking the training, who is willing to go forward with that training and is self-directed and willing to do that based on their scores and some kind of analysis where you can get that kind of information back to them. And plug people in the right place. It’s kind of a shift to the learner. He’s going to have to learn it, but you can let him guide it, because he’s an adult learner, it’s not like a kid learner. This is like I said something about something else that you first asked, that’s what I see. People are going to naturally go to what they feel will best suit them. And if they don’t, they can always back up. Ultimately, if they have to learn everything, but based on what I’m talking about, it allows them to self-direct. So, top-down and bottom-up, bottom being the young airman is going up, learning the processes, probably knowing he has to learn all of it. But top-down is seeing who is — you can analyze, the means to learn how well they did, are they good at it, would they make a good leader? Or are they someone who would be on a team? And that’s what I’m trying to convey. On the top-down, I guess you would either have a person, or the system, even, based on what people have chosen to learn; they might then present them with more things to learn kind of along that path. And start to, depending on their choices, even influence what their assignments might be? Exactly. You want people who are going to be effective in leadership roles; you’ve got leaders and followers, and everyone’s got a place in the whole scheme of things. I just think there has to be some kind of measurement within the communication that people could give metrics, but not only where you’d place in the military, where you would place someone who is best suited for that position, but also you see how quickly they went through: why did some people go slower? How was their grade on it? This is kind of a sidebar to what I’m saying as well. And should it impact the instruction? If the instruction seems to not be getting it quite — say you have 10 students, and they all seem to navigate to this course. But for some reason, nobody’s getting it. Is there something wrong with the instruction, how it was designed? Or is it something — what’s your focus? With your terminal learning objective, are they getting that? I basically got three thoughts, but the main point, the main gist, is top-down, bottom-up. The learner is moving up and it’s based on a big program that he, and he may have to take it all, but you allow him to self-guide based on his score, both quantitative, how many courses he’s taken, and qualitative, how he did. Will help the top-down make decisions for who will be best-suited for that organization. Kind of like talent-management, and that’s a buzzword that gets used a lot. I know it’s a different way of looking at things, I mean you mix it together, you could have ten people all doing the same test, that’s not really what this is. Ultimately, decision-making, if you are in a leadership position, I know you really need to start looking at this course — it allows a progression, I think adult learners know. If I’m at home and I looked up something like, I like aircraft. I want to learn about the Concorde so I’m like, where and when was built; and it was built in this location, then I want to learn about the engines. But it’s not routing; well, who is gonna be, who made those engines and then you are routing. But it’s all about the main picture, it’s all about the plane. Take that plane and make it a course curriculum, let me have multiple levels and layers that are in there and I will say, “Hey, we wanted you, we hired you, you’re on the force.” I mean, I know the military, it would be a total paradigm shift in the military to say, “This is what you’re doing, go do it,” My dad was in the Air Force, it’s a different thing, and things will have to change. I never thought I would be able to go into a Wikipedia or Facebook on .mil network, but yet, I can. If you went five, ten years ago, that medium, that just wasn’t possible. So the whole dynamic is changing. I think SCORM, whether it will be a SCORM 2.0 or whatever, will be — I know this whole CMI harmonization is going on. There’s different components and I think SCORM will be a part of it, but in the broader scheme of things, there’s going to be so many different levels, and like I said, I really see it as the future will be very mobile and very collaborative, and that’s a very top, very simplistic way of expressing it, but that’s where it is. 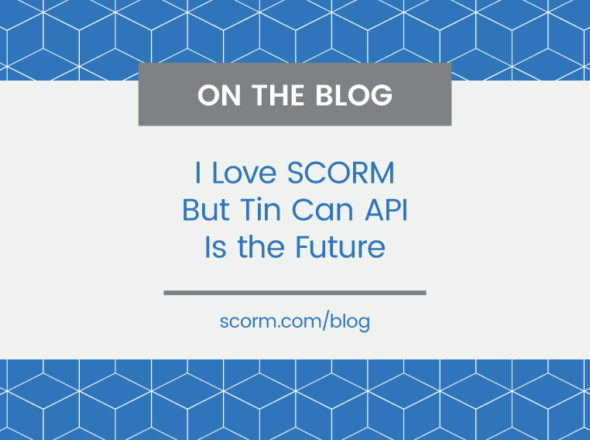 I’m all about SCORM! I’m just saying that SCORM will be part of the whole situation. There’s people, everybody advocates for every particular thing. Some people are really into games, into augmented reality, or some are into mobile. It’s like a menu. You go to a Mexican restaurant you get al a carte, you get two tacos and a refried beans. You pick and choose. There’s still going to be classroom instruction and books, still people who watch video tapes. But there’s always going to be people who will have LMSs. So there’s going to be — I think the word LMS and how it quite is now, and how it will be in the future, I think, are slightly different. You always read articles day in and out, asking is the LMS dead? I don’t think the LMS is dead, I don’t buy into that. Because there’s still classrooms, you don’t have to bury previous technologies and ideas, and supplant them with new ideas. You can blend them, the whole blending of old and new. I think that LM, or what e-learning is in general, is going to always have an LMS because that word, LMS and “Learning Management System,” that’s going to be where it evolves and how you manage it, where I’m going back to with the top-down, bottom-up where the learners are able to kind of maneuver and top-down can see who would fit into key positions. And you can learn a little about the learner, because people who are willing to take charge and go and just go, and not being forced to do it, doing it because you want to do it and that, maybe those people you want up in higher or middle management. It’s just a theory, my opinion. Do you have a sense of if the military would be interested in adopting this sort of thing if it were available? When you initially asked, this is something I’ve been thinking about for quite some time, but it’s just an internal thought — I haven’t gone too far with it. It’s where one’s learning — it’s just a take on, you’re going from instructor-side, instructor-led, and the design of the content, where it would be more learner-led. That would be a change in the military mindset. A major change. But I keep hearing about how the Army is using some smartphone, so I think the military is willing to adapt and that’s a good thing, so what I’m describing is kind of out of — I think this would be more directed towards the corporate world, you know? It wouldn’t work in K – 12. It could work in the military, but I don’t see it working, though, right now in the military. You want your soldiers, you’ve got that whole military soldier, be part of a group of one. You would have to say, well this , this one, is making decisions, that would be a change in the dynamic. This would probably suit more of a corporate world, I would think. What I’m talking about. Now in K – 12, to some small extent, but more in the higher end, this sort of thing, at least the bottom-up, does sort of exist, right? In that students can choose, and certainly in higher-ed, students can choose majors, and then they frequently choose concentrations, they choose which specific classes they want to take. And it’s not — or, I guess that’s at a much more granular level. I think you are talking about it’s, people being able to jump from concept to concept and it’s a much more fluid way, but I think that’s the closest analog you can have in the physical world, breaking it up into classes. You make a good point. Going to higher-level education, I graduated with my Bachelor’s back in ’94, and they didn’t have online schools. But wouldn’t it be neat if they had, like, business schools, and you could say, “I don’t really know what I want to do in business, but I want to do business” and the business school says, “Hey, come on board.” And you go into business and then you start taking courses and it’s about administration, more the administrative management side of things, and then all of a sudden it’s talking about the things you would be managing and one happens to be marketing. And you start to take marketing courses, and you see that you got, there’s a difference between domestic marketing and international marketing, and you start to move that way, and you come out the other end, even though at the front end, you went into business school, on the back end, you have got a Bachelor’s of Science in Administration and Marketing with a specialization in International Affairs. It’s what I understood, how I see it, what you’re saying. I think you are taking my thoughts further — I was thinking that this, already in higher- ed, there is some amount of choice, currently. And that people can choose their classes. And you want to add to it. I think it’s what you did with my example, you took higher-ed and went farther with it — this is how that choice — it’s kind of a logical extension of having a level of choice, where you already do. You have e-learning, or if in most of the courses are e-learning, if the instructor led learning, you have limits on the number of students who can be in each course, and so on, so you have to plan it out farther. But, if it’s learner-led, there’s probably also less limitation in terms of people being able to change their minds. So, whether they’re ready for it or not, I don’t know; but it seems like there is a potential use that in higher ed, or that there’s some level of choice in K – 12. I just think of that being a unique communication. Something — are you part of the CMI harmonization group? Oh, you’re not. I’m doing it not for ADL, I just want to know what’s going on with them, so I have been invited to go each Friday and listen about communications. It’s kind of why my mind — with Tin Can and CMI harmonization, much like Future Learning Experiences, I think they are very complimentary, and that’s what communication and modernization I was, always would have thought would be neat, sequencing and navigation. That kind of communication I always thought that was never there. And does it need to be there? I don’t know. Maybe, maybe not. It’s just something that I had been thinking out over the years. Using past experience, when I worked at Tyndall Air Force Base in Panama City, I was developing content for headquarters’ ACESA which is Air Force Civil Engineers Support Agency, we were at SCORM 1.2, and then I had to read a book about this thing called sequencing and navigation. Most people, that had always been their number-one complaint, sequencing and navigation is just a bear, but people have adopted it. I know still a lot people probably use SCORM 1.2, but that being said, I have heard that’s the number one thing that seems to make people very apprehensive. SCORM is like a four- letter word because people are afraid of the sequencing and navigation component. People have adopted it. It just takes time. I guess what I’m saying is not so much about SCORM, but it’ll happen. It will be adopted, it may be slow. If it’s a good idea and you get a lot of sign-up within the community as a whole, it’s just, it takes time, is how I look at things. Everything has its time and place. We do want to get ahead of what people are ready to implement right now. Regarding the idea concerning top-down, bottom-up, I would like to discuss it more internally, with people from the ADL, but I just haven’t really, it’s just a thought that’s been going through my head. Because you are wanting ideas and I didn’t have — it was just something I thought would be an interesting take on an idea. People have suggested some similar ideas, or some technical solutions that might allow this. When I go home this evening — and I admit it — Wikipedia, people like it or they don’t, but when I go home tonight, and for example, hobbies I like are history, airplanes, trivia. If in trivia, I can look at anything, I can just click on anything that’s on the front page, and from what I get, from what I see on the front page of wikipedia, it may drive me into I didn’t even know. You could be looking at a picture of Abraham Lincoln and next thing you know, the city he was from, and then the next thing you know, you are talking about — that’s the thing. You’re directing yourself. But it’s still learning. It’s just, your interests are taken, and how you can plot that and track that. There’s three components built into this thought: about track-ability from top level management to the bottom-down, having students who ultimately may have to take all the content in a square box, but tracking how fast is their willingness to go on ahead, and how good they are. And how it would be measured. That’s the communication I’m going on. How do you measure that, both in a quantitative and qualitative state. That’s what I’m thinking. I just wanted to focus on one thing. That shouldn’t be taken too literally in this instance — you still have to have sound instructional design. And this would all be content that would lend itself to other content, and back to the source of my idea — like I said, the young chef learning to make a sandwich — you need peanut butter and jelly, a piece of bread. But he happens to notice off to the side: knife, napkin, plate. He wonders what that’s all about and he clicks on those, and the next thing you know, it’s talking about another course, and you think well, how do you do table settings, and that knife, draw a circle around it, and then create another expanded circle that goes to knife and nothing else, but talks about different things you could do with that knife. It’s more structured, for that instructional material you want that user to learn, to get. My wiki-walk is randomness, but this would all be in a confined space that all inter-relates to itself, that comes back on itself, but maybe would be in different directions. But do you basically want learners to feel almost as free as if they were doing a wiki- walk? But nudge them in the right direction? Yeah, you nudge them. I’m not showing any brand loyalty or influences, but logo, It’s an assessment tool, and it’s called Question Mark, and it’s got colored circles? It would be like center of that, if you can imagine this logo of theirs, if they still use it, I don’t know. But how they are drilling out from that and can them into different things using the example of this young chef, he might be more of a produce manager; he might be less of a chef and more to that. People might want to be that chef, but this cooking school could ultimately be more about restaurant management, or how they drill out, could help them be front-of-house, or someone has to work front-of-house, someone else may learn more about how food compliments different wines, a sommelier component. It’s all how they drill out. And I was using the cooking idea, just to explain how it would relate to the greater scheme in my idea. I guess — let me put a different idea, or a related idea, in your head: you’re talking about where it’s directed, and there’s very purposeful, sound instructional design, and they are kind of given a box to browse around in. But, what about where they are just going off and finding whatever interests them, and they go off and find some things that, because they have an interest in, is relevant to what they do in their job or so on, that they find something they think maybe they should get credit for.They found something that may not be put out by their organization at all, and they say they think they should get credit for reading or experiencing that thing. And they have a way to indicate that back to whatever system, if there is an LMS, and then maybe someone handling training decides whether or not to give credit, share with other learners. And it seems like in a way, that’s related to your idea. Less within a box, but more someone seeking their own relevant info. which does bring it back to a box. It does bring it back to a box, but it allows the student to — anything can be of value. Any form of communication or knowledge. But if you’re in a cooking school, all we really care about is whether or not they know how to cut the cooking times, what it takes to be a chef, I’m not a chef, but those things, it’s fine so long as we’re talking about cooking school, any thing that would relate to cooking. But in this area- space, we drop the student in the center and allow him — There’s nothing worse, like sit there, if you are buying a car, a two-door sports car and you decide it’s great, but then you bought in, you bought the car, but all of a sudden you’re wife says, “We’re expecting twins!” Well now you have to have a four-door car. Well take that car example and apply it to the student. Drop that student in and he says, “Hey, I know I want to be in cooking school, but which way do I want to go?” More into French, or Italian. He could take a class and say, “Well maybe not,” and redirect himself, maybe into rustic Italian. It allows for some flexibility. But it keeps them within the confines of the culinary arts, the cooking school. I was hoping this wouldn’t be too out there. I just felt it needed to be addressed. You’ve got to remember — I don’t want them to walk aimlessly, it’s still trackable, I want them to have that decision-making so it’s a benefit to the learner’s side, but also on the other side for the instructor, and for the benefit of upper management and people who might make business decisions. You might use this to make business models for a corporation where they could see, quantitatively and qualitatively, the metrics that could come from this. That’s that bit of communication I don’t think is there. What data do you think should be tracked about learners? You have the basics, the learning objectives, if those have been met, you need to put a value on that. It has to go from a variable of 0 to 1, 1 meaning you know it perfectly, then fractions of that number down to zero. Quantitatively, you want to know — let’s say it’s a five lesson course, to make it simple. And there’s an assessment at the end of each lesson, and basically you are noticing that the student was good on lessons one, two, and five. But not so good on three and four. It’s something you want to flag so the instructor on the other side, when he’s checking something he wants to drill, you say, “You really want to go back and look at lessons three and four, and here’s why, and here’s some further information,” maybe something to remediate the learner that you can actually have them learn. But you can say, you know, I’m not into that, and I really want to go in that direction. Well that might be another call, and that call is telling you that if you weren’t interested in one, two and five, which is basically a summation of it all, this might take you in a different direction that can lead your path. Like you drop them in cooking school, your learner takes a French cooking class, doesn’t like it, but backs up and goes into Italian, and maybe he wants to learn all variations of it. So you want to track interest, not just proficiency? It’s interest, it’s proficiency. I want not just quantitative, but I want to know of those courses — it might be surveys just built into — some kind of mechanics, piece of communication, that sends it back and you know they got it, but it’s like, you can be book smart but not necessarily street smart? It’s good to say you know something, it’s that unknown variable, you can be good at taking a test, but when it comes to actually doing it, it may not be that, that hidden unknown is maybe not even possible. That’s what I’m trying put my finger on. I don’t know the word, what word I want to use for it though. Do you think as part of this, you’re going to have to be very careful to either have each sub-piece of content truly stand on it’s own, or adapt to taking into account what they’ve already learned. And did you have thoughts about which of those would be preferred, or do you think we would need to do some of each? I probably need to think about it some more and would really like to discuss it with my colleagues. This is not ADL, this is me throwing out ideas. I initially was going to create a laundry list, but then I thought no, I want to think of something I want to see, but haven’t. If it’s already been done, great. It’s just something I thought would be neat thing to address.